The World Cup returned to Europe in 1982 as sunny Spain, land of Don Quixote and Salvador Dali, welcomed soccer's biggest stars. Spain was a country in transition at the time, slowly moving towards a liberal democracy and away from a dictatorship following the death of General Francisco Franco. Like the host nation, the World Cup was also in transition. Sir Stanley Rous, the former FIFA president, raised the issue of expanding the World Cup to 24 teams in 1970. So it came to pass in 1982, thanks to the exploits of Joao Havelange, Rous's successor. With eight new teams added to the mix, a change of format was required: the 24 countries were divided into six groups of four with the top two advancing to the second stage. The 12 survivors would then be divided into four groups of three, essentially a quarter-final round, with the winners moving on to the semifinals. Though the World Cup was back on European soil, it was the South Americans who were the pre-tournament favourites. Critics were calling this Brazil team - with the likes of Zico, Socrates, Cerezo and Falcao - even better than the legendary 1970 squad. Argentina, the defending world champions, included Diego Maradona, who would be making his World Cup debut after being passed over four years earlier. European hopes rested on powerful West Germany, fresh off its victory at the 1980 European Nations Cup. Midfielder Paul Breitner returned to the national team and the Germans also had forward Karl-Heinz Rummenigge, the reigning two-time European player of the year. This tournament, played out under the blistering Spanish summer heat, was to be a World Cup of startling upsets, improbable finishes and unmatched drama, with a fair bit of controversy thrown in for good measure. In the opening match on June 17 in Barcelona, Belgium outplayed Argentina and was rewarded for its effort with a shocking 1-0 upset victory over the champions. It was a sign of things to come. Hungary thumped El Salvador 10-1, the most lopsided result ever at the World Cup, but it was Argentina, who rebounded with two victories, and Belgium who progressed from Group C to the next round. Northern Ireland, back at the World Cup for the first time since 1958, was the surprise winner of Group E after it stunned Spain 1-0. The Spanish were held to a 1-1 draw with first-timers Honduras and only managed to finish second in the group by virtue of its win over Yugoslavia. Brazil looked every bit the tournament favourites when it reeled off victories against the Soviet Union, Scotland and New Zealand, another World Cup first-timer, to finish first in Group F. England also started out with three straight victories en route to winning Group D ahead of France, who defeated Kuwait, playing in its first World Cup, and tied Czechoslovakia. MATCH OF THE TOURNAMENT: Italy's 3-2 victory over Brazil in the quarter-finals. Legendary BBC play-by-play announcer John Motson called this the greatest match he's ever commented on. It had drama, fantastic goals, great saves and one hero: the indomitable Paolo Rossi who led the Italians to victory over a Brazil side the critics hailed as even better than the 1970 World Cup winning team. The France-West Germany semifinal ranks a close second. MAN OF THE TOURNAMENT: Paolo Rossi. There could be no choice other than the man who led the Azzurri to their first World Cup in 44 years. Rossi was kept scoreless through the first four games, but he exploded out of his slumber with a hat trick against Brazil in the quarter-finals en route to scoring a tournament-leading six goals and cementing his place as one of the greatest World Cup heroes of all time. SPOTLIGHT: Not only did Paolo Rossi win the Golden Shoe as the tournament's top scorer, but he was also awarded the inaugural Golden Ball award as World Cup MVP. He was later recognized for his accomplishments in Spain when he earned the Ballon d'Or award as the European player of the year in 1982. The 1982 World Cup marked a turning point in Rossi's career. In 1979, while playing for Perugia in Italy's Serie A, Rossi received a three-year ban after being implicated in a betting scandal that rocked Italian soccer (Rossi to this day denies any involvement). The ban was later reduced to two years and his suspension ended just months before the start of the World Cup. His inclusion in the squad was derided by Italian journalists and fans, pointing out that the forward, who scored three goals in Argentina in 1978, was out of shape. The criticisms grew even louder after he contributed little and didn't score a single goal through Italy's first four games in Spain. But Enzo Bearzot had faith and he was duly rewarded in the Brazil game - a marvellous hat trick by Rossi was followed by three more important goals in the semifinals and final as Italy won the World Cup for the first time since 1938. Rossi, the player few Italians expected to come through, became a national hero. AND ANOTHER THING: The strangest incident of the tournament took place in Valladolid during France's win over Kuwait in the first round. Late in the game, midfielder Alain Giresse burst through the Kuwaiti defence and scored to give France a 4-1 lead. Kuwait's defenders vehemently protested the goal, claiming they stopped midway through Giresse's run because they heard the whistle blown (as it turned out, a spectator in the stands behind Kuwait's goal was the whistle-blowing culprit). As the players surrounded the referee, Kuwaiti FA president Prince Fahid came down to the sidelines from his seat in the stands and threatened to take his players off the field if the goal was not disallowed. Inexplicably, the Russian official overturned his decision and the game resumed, but not before Maxime Bossis scored France's fourth goal in the 90th minute. Group A was the tightest of the six opening groups with Poland collecting the only victory, a 5-1 effort over Peru. Draws against Italy and Cameroon, an African nation taking its World Cup bow, was enough for the Poles to top the group. Italian manager Enzo Bearzot took tremendous flack for selecting out-of-form forward Paolo Rossi at the start of the tournament. The criticisms only grew louder as a lethargic Italy stumbled to a pair of draws against Poland and Peru in its first two matches. In its final game against Cameroon, the Italians took the lead when Francesco Graziani found the back of the net in the 60th minute, only for Cameroon's Gregoire M'Bida to hit back a minute later. Both teams drew all three of their matches and finished deadlock on three points but it was the Italians who advanced by the skin of their teeth having scored one more goal than their African counterparts. Austria and West Germany shamefully conspired with one another in Group B, draping a blanket of controversy over the competition. Algeria, playing in its first World Cup, pulled off one of the biggest upsets in the history of the competition when it earned a 2-1 victory over West Germany in Gijon on June 16. The Africans looked a sure bet to go through to the next round after they defeated Chile on June 24 in Oviedo. Austria and the Germans faced off in the final match of the group the next day back in Gijon. Because FIFA did not require the final two games of the group stages to be played simultaneously, Austria and West Germany knew that a 1-0 win for the Germans would be enough for both nations to advance to the next round. And so, the two neighbouring countries had their arrangement and stopped playing when the Germans went 1-0 up after 10 minutes. From that point on, the game slowed down to a crawl with neither team seriously venturing forward. The Spanish spectators in the stands booed both countries unmercifully as they carried out this sporting fraud, and Algeria protested the result to FIFA the next day, but soccer's world governing body turned a blind eye and let the injustice stand. Poland, grouped with the Soviet Union and Belgium, advanced from its quarter-final pool, as did the Germans, who beat Spain and held on for a 0-0 draw with England. The English had played well - they went undefeated in five games - but injuries to star players Kevin Keegan and Bryan Robson, coupled with a lack of scoring punch up front, meant they went home empty-handed. After a listless opening round, France found its form in the quarter-finals, thanks in no small part to the holy triumvirate of Michel Platini, Alain Giresse and Jean Tigana. The French defeated Austria and easily disposed of Northern Ireland 4-1. Things looked bleak for Italy, lucky to even to have reached the quarter-finals, as it was drawn into the "Group of Death" with Brazil, the tournament favourites, and Argentina, the reigning world champions. The Italians, though, outclassed Argentina in earning a stylish 2-1 victory in Barcelona in the group opener. The Italians benefited greatly from defender Claudio Gentile, an un-appropriately named player if ever there was one, who brutally hacked down, punched, pinched and stomped on Maradona for 90 minutes. The Romanian referee paid little mind, Gentile kept Maradona in his back pocket. Brazil ran out 3-1 winners over Argentina in the next game, and the champions were eliminated. Maradona was red carded for a despicable foul on Brazil's Joao Batista with five minutes left. It was a fitting end for a player who failed to make any kind of an impression in Spain. The World Cup, however, did not see the last of the Argentine genius. The final match of the group between Brazil and Italy in Barcelona was the decider, with the Brazilians needing only a tie to win the group. It was in this classic game, regarded by many as the greatest ever to take place at the World Cup, in which Paolo Rossi awoke in spectacular fashion from his slumber. Rossi was, again, a non-factor against Argentina, and the cries from the Italian media for manager Enzo Bearzot to drop the forward grew louder. Rossi scored twice in the opening 25 minutes to give the Italians a 2-1 lead, but Falcao scored for Brazil in the 68th minute to level the score. Italy was devastated - a tie would do them no good - but Rossi stepped forward and became a national hero when he completed his hat trick with 15 minutes left in regulation. Italian goalkeeper Dino Zoff flung himself across the goal-line to make a brilliant save off a header from Cerezo in the dying minutes of the game to preserve the victory. Astonishingly, Italy was through to the semifinals and Brazil went home. Rossi showed his explosive performance against Brazil was no fluke when he bagged both goals in a 2-0 win over powerful Poland in the semifinals. Italy ran roughshod over Poland, who was without the suspended Zbigniew Boniek, and suddenly the Italians looked unbeatable. The other semifinal, between France and West Germany in Seville, produced another all-time classic with equal parts drama and controversy. The teams traded goals in the first half, but the game turned in the 57th minute. Substitute Patrick Battiston raced through the middle as he tried to catch up with a brilliant pass that split West Germany's defence. German goalkeeper Harald Schumacher rushed off his goal-line and, without even attempting to play the ball, viciously thundered into Battiston with a forearm to his face. The malicious blow sent the Frenchman crashing to the ground in an unconscious stupor - minus two teeth - and Battiston was rushed to a local hospital where he narrowly avoided death. Incredibly, the Dutch referee did not even give the despicable Schumacher a yellow card, and instead awarded the Germans a goal kick. With the tension building and the score tied 1-1 at the end of regulation, the French scored two quick goals in extra time. Les Bleus were on their way to a date with the Azzurri, or so it seemed. The resolute Germans bravely fought back. Karl-Heinz Rummenigge, just minutes after coming into the game as a substitute, scored for Germany after 102 minutes and Klaus Fischer levelled the score six minutes later. The drama on that hot sticky night in Seville reached a crescendo as the game went to a shootout. Schumacher made two saves and Horst Hrubesch scored the decisive goal to give the Germans an improbable 5-4 victory on penalties. Heartbroken, and feeling somewhat cheated - aside from Schumacher's attack on Battiston, the referee also ignored two blatant fouls committed by Rummenigge just before he scored in extra time - the French benched most of its star players in the third-place game against Poland and lost 3-2 in Alicante. West Germany and Italy met in the final on a warm night in Madrid on July 11 in a rematch of their classic 1970 semifinal. The Germans gained few friends after conspiring with Austria and fewer still after Schumacher's brutal attack on Battiston. Little wonder, then, that the Italians were buoyed by the overwhelming support of the Spanish fans in the final, the Germans viewed as the unscrupulous villains. The first half at Santiago Bernabeu stadium mirrored a prize fight between two heavyweight boxers: both teams danced around and felt each other out, cautious not to throw a wild punch out of fear of being caught off guard. Full of fouls and stoppages, the first half was a tedious affair, the lone moment of excitement coming in the 23rd minute when German defender Hans-Peter Briegel fouled Italy's Bruno Conti inside the penalty area. Antonio Cabrini stepped up to the penalty spot, but pushed his effort wide of the post. It was the first missed penalty shot in a World Cup final, but it was also the turning point in the game. The Italians did not wither on the vine, despondent over Cabrini's miss, but instead regrouped and came out attacking in the second half. Their persistence paid off when Rossi - who else? - scored his sixth and final goal of the tournament in the 57th minute. Claudio Gentile strolled down the right wing and knocked a lazy cross into the penalty area. The German defence was guilty of ball-watching as Rossi perfectly timed his run into the box and smashed it past Schumacher. Twelve minutes later it was 2-0. Defender Gaetano Scirea and Rossi broke down the right side before the ball was played into the middle and Marco Tardelli ripped a vicious shot past a helpless Schumacher. The Germans were done, but Italy made sure of it in the 81st minute. Conti dragged the German defence out of position and sent a perfect ball across the box for Alessandro Altobelli to knock into the net. Germany's Paul Breitner scored two minutes later, sweeping a shot past a diving Dino Zoff, but it didn't matter. Italy were World Cup champions for the first time since 1938, a scenario that nobody would have predicted after the Azzurri's laborious start to the tournament, but one that was more than appropriate given the character and grit displayed by Enzo Bearzot's men. Chief among them being Rossi, who repaid Bearzot's faith in sticking with him by finishing as the top scorer of the tournament with six goals and winning the inaugural Golden Ball award as World Cup MVP. 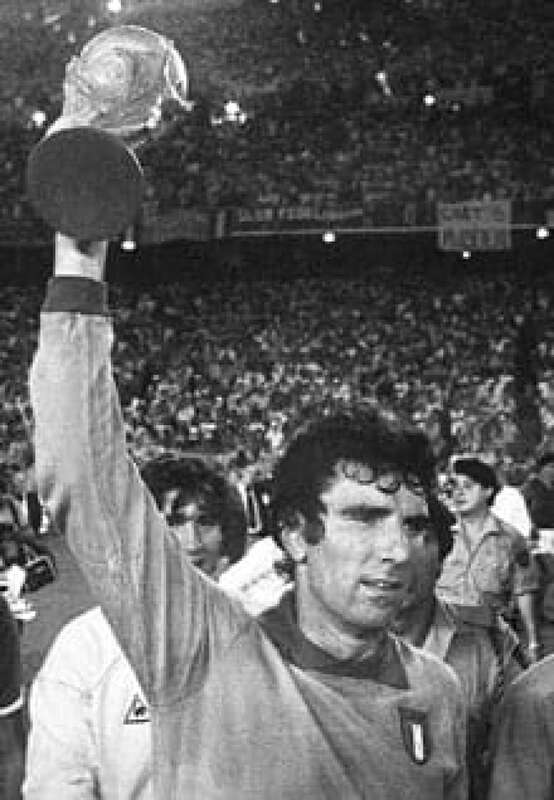 Zoff, Italy's 40-year-old captain, led the procession of Italian players up to the royal box in the stands as King Juan Carlos of Spain presented him with the World Cup trophy. As Zoff lifted the trophy, the gracious Madrid crowd saluted the Azzurri, and millions of fans back in Italy celebrated and prepared to welcome home the new kings of soccer. Fourteen cities and 17 different stadiums (two each in Barcelona, Madrid and Seville) staged the competition's 52 games. Italy's Dino Zoff, at 40 years of age, is the oldest player to ever win the World Cup. Belgium's 1-0 victory over Argentina in the first game of the competition was the first tournament opener not to end in a 0-0 draw since the 1962 World Cup in Chile. Following the Austria-West Germany debacle, FIFA corrected its mistake by introducing a revised system at the 1986 World Cup and future tournaments where the final two games in each group of the opening round were played simultaneously. Curiously, Seville police barred Red Cross officials from the sidelines during the France-West Germany semifinal. As a result, Battiston was lying prone on the field unattended for three minutes before he received medical attention after being fouled by Schumacher. Runners-up in 1974 and 1978, the Netherlands was nowhere to be found in Spain as they failed to qualify for the tournament. The Dutch also didn't make the grade in 1986 and would have to wait until 1990 to make their World Cup return. It's no exaggeration to call Algeria's win over West Germany one of the greatest upsets ever at the World Cup - bookies listed the African nations as 1,000-1 long shots to win the World Cup prior to the tournament, the West Germans were 3-1 favourites to win it all. At 17 years and 42 days of age, Norman Whiteside of Northern Ireland became the youngest player to appear in a World Cup game when he saw action against Yugoslavia in the first round. Hungary's 10-1 win over El Salvador in the opening round was the biggest victory ever at the World Cup. It beat the old record set by Hungary in 1954 (9-0 vs. South Korea) and equalled by Yugoslavia in 1974 (9-0 vs. Zaire). Hungary's Laszlo Kiss is the only substitute to have scored a hat trick in a World Cup game. Hungary led El Salvador 5-1 when Kiss came on in the second half and scored in the 70th, 74th and 77th minute. Kiss's hat trick, taking a mere seven minutes to complete, was also the fastest ever recorded at the World Cup.